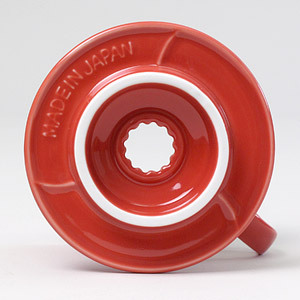 We are sorry but the Hario Ceramic 1 Cup Filter Cones is temporarily sold out. No more are expected until after the holidays. We do have 1 cup ceramic filters available in white. Hario 1 cup ceramic filter cone. Available only in chocolate brown at this time. 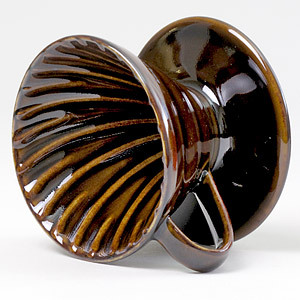 Filter holders have a curved, swirl design to improve coffee flow. Prevents water from simply standing in the coffee bed. 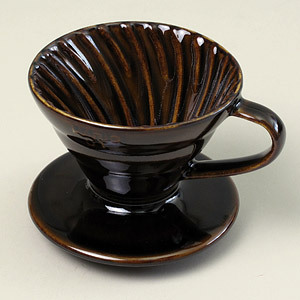 This design produces clean cupping coffee and avoids bitterness that is associated with an over extracted brew. Channels inside the cone are in a swirl pattern to facilitate flow. Filter cones come boxed and are furnished with a measuring scoop. Hario filtercones are also available in plastic and glass.